This is the first time I've ever seen a Kindle clone with an LCD screen. This ereader isn't quite on the market yet, and there are very few details available. But I do have some I can share. It has a 7" screen, 400MHz CPU, Wifi, SD card slot, and according to the flyer Augen just sent me the Book will support Adobe DRM. Video and audio support is also listed, and you can read in both landscape and portrait mode. I'm a little concerned about the size. I have a couple 7" tablets, and they're both slightly larger than the original Kindle. This guy is going to be even bigger. I'm afraid it will be too awkward to hold. On the other hand, it weighs less than I thought. Update: Free Web browsing on the Kindle int’l. I am very interested in this Augen e- reader since it does a lot of what of what I do on my Linux notebook. Since it is not available yet I guess I will wait for a while to make a decision. I have one big concern. I have a 7″ Windows CE 6 netbook. It frequently entirely dumps its OS install, and I have to reload it from an SD “boot disk”. I would like to buy a 10.1″ version, and am also interested in this Augen device. But I will only buy if this problem has been addressed, and this constant intervention on my part is not necessary. Also, my CE 6 netbook has no support for Flash 9 content playback. Also a big issue for me…will Augen’s The Book play Flash 9? That OS problem is actually pretty common, and it’s why I won’t consider a WinCE netbook. you can buy today from heartlandamerica for $129. I have the Augen E-Reader ordering info in the latest Heartland catalog, but I’m still waiting on a serious technical or consumer review: after a thorough test drive. Has anyone actually operated it yet? I sent them an email a couple weeks ago, but never heard back. I’ll go bug them again. The Heartland order clerk told me that the Augen e-reader had a USB interface and connecting cable, which I don’t see in the specs. I’ve not yet received it so I don’t know the facts. Does anyone know for sure ? Its lack is a big weakness in the i-pad. I don’t know for sure, but I do expect the Book to act as a USB drive when plugged into a PC. It just makes too much sense not to do it. Wait 2-3 weeks and it will be introduced in stores at a major national retailer in the US for about $50 less than Heartland America. I’ll let you all know when they arrive. distribution will be around $90.00 cost. I don’t see this being sold less than $129.00 anytime in the future. It’s at KMart for $99.99. Can you give me a link? I can’t find it. Menards is having it for 69.99 after a $20 rebate. For the Black Friday sale, yes. I have just purchased this ereader and my final veridict is that its going back to the store the very next day. As a ereader it seems it can tackle the task of displaying words on the screen but once you try and load a big file say 73mb of a pdf book and it will load one page at a time taking about 6 sec per page. As for the internet it takes so long to load any page. The only page it loaded in less than 5 sec was google.com just because of its simplicity. The screen is nice and bright but it hardly supports any picture files. Dont try mysic or movies, the infantile settup and dysplay makes it seem poking at roadkill would be more fun. Please dont waste your time buying this product I will try and put a youtube review by sunday 7/16/10 titled Augen the book review or something around those lines. Again Do not waste your time and money on this!! This product is the worst, aside from the nice colorful screen the wifi web browser is super duper slowwwwwas well as downloading speed. Folks it’s a no go. On sale at Kmart for $89.99. Thanks, but I got that already. I can see why many readers don’t have text to speech if this is as good as it gets. I’ve only looked at the included books so far and that was ok except it’s slow to load. I’m going to kick the tires for a bit but right now I’m disappointed and expect I will be spending more for something else. I pick one up at Kmart this morning. The concept is great but this thing is slow on the net. The good thing it’s Linux based. I sure an update would improve things. Also can’t rotate web pages for wide screen view. Have not tried ebooks yet but the comments on large PDF is slow. Seems like might return “The Book” unless an OS update comes out very soon to address the speed issues. Without a code update to improve this device’s shortcomings, I personally don’t think it’s worth th $90 I paid. Something that bothers me is this company has a very small feel looking at their web site. There is very little support info for any of their products. They advertise an open source SDK but a support person says the device is locked and not open to mods. I don’t see an SDK available. I would question when or if an update will come. To each their own but for $60 more I can get a Nook with E-ink, a 10 day battery and decent web browsing. I think this was a great concept but not implemented well. I need to decide whether to keep it in hope of it being hacked or updated or return it. Is there really a need to speed up this e-reader? I thought it was pretty speedy already. I bought the reader and found it not to keep the time and the date after is is loaded. The books pre-loaded are okay. I have found difficulty with using the wifi feature to try and buy books. The reader is not compatible with windows 7. Have not received a response from customer service with complaints about the reader regarding time and date problem as well as incompatibility with windows 7. I picked one up for $89 at Kmart yesterday. Still playing with it. Light, easy to hold. Screen auto rotates nicely while reading. Graphics are decent. UI is simple. Input with keyboard is decent. I love prev/next/home buttons on each side of the screen. Not crazy about having the earphone jack at the bottom of any device. Page turns are speedy, which is nice. Surprised it has a decent text-to-speech capability. Unless I’m mistaken, there doesn’t seem to be a night reading mode, which would be a bummer. Wi-Fi isn’t bad at all. No issues with connecting but it does need to see an SSID to connect. Not sure what the deal is there. Currently working fine on my WPA-PSK2 secured network. Most of the functions and features are what you’d expect from any reader and I’ve no complaints. Especially for $89. The included leather cover/case is a nice little touch, even if it’s a bit cheesy. The same goes for the note-taking feature. I think the big complaint I have is it’s sluggishness when it comes to web activity. As an iPad user, I didn’t expect this reader to be a tablet or web browsing device. It’s a reader. I get that. But if you’re going to put a web browser in your device and have a feature that allows you to shop for books, make sure the device and your software can bring up those pages at decent speeds (even if that means you have to resort to using a cell phone WAP browser). 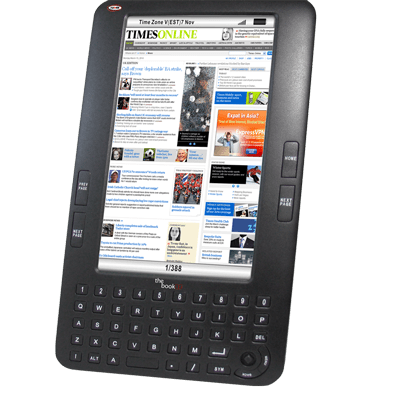 A browser on a device like this or the Pandigital Novel (which I also have, and it handles the web and Wi-Fi beautifully) is meant to shop for books, quickly look up something, read the news, maybe check email, etc. on-the-fly. Nothing more, realistically. My philosophy regarding readers is that the manufacturers need to get their first generation model mostly right in several key aspects in the first place if they’re going to have any success. Updates for readers are almost nonexistent. Wi-Fi/internet connectivity is a must, nowadays. The age of the readers that get their content solely via USB is gone, thankfully. I think the whole e-ink argument is also dying out with the proliferation of color LCD screens and improving technology that allows for a better user experience with them. For reading ebooks, I think this reader will do just fine. The price point is terrific and it would make a great gift item to get someone started in ebooks, if nothing else. I will test it soon for SD card integration, PDF rendering and battery life. Just picked up one at K-Mart as an open box item with a nice discount. Indications are that many units are coming back and rather quickly, WiFi problems are the main reason. I did a quick check with web connection at Mickey Dee’s and it was a bear and that into a open system. Attempted to connect to my to my home AP was a no go, needed to reduce the AP to NO security and showing the SSID, No way not even in my early days,who ever ran that…. If AUGEN will not put out a “UPDATE” rather soon to fix the Wi-FI issues like selecting 64 or 128 and entry of SSID and do it rather QUICKLY K-Mart will have a whole bunch of RETURNS and will be a rather ticked of CUSTOMER to say the least. As some stated you have 90 days from date of purchase. Watch OUT AUGEN…. The wave is coming and your Android offering will not be look on kindly if you do not ix this one…. Ok spent a evening playing with AUGEN “Book” I have to say that this is bringing me ma back in time (10 years) to my days consulting with some Korean firms that needed direction in product integration, I guess that this is needed in CH land. It’s a SHAME to WASTE technology in such a way, this product has the technology BONES in it is running Linux now so why such a flimsy implementation of applications that are running operationally“equipped” on open porting builds. It’s strange to see this poor implementation on an excellent frame. I fired up my 6 year old Toshiba PDA, yes its running “Windoz” and with a few outside (yes they are dated) applications performs way better in all of the areas then this 2010 device, the only area that it was equal was in the SD WiFi lameness…. I cannot believe that they where not even able to get the headphone jack setup correct….. The best thing that AUGEN can do at this time is to open up the device and let the Linux community mod it and make it the “killer” that it can be and not the sales killer that it s becoming for Augen and their distributors (K-Mart). I will hold on to this device for at least the next month or two to see if we see any movement from Augen, if not it will be going back to K-mart before the return policy expires. Still such a waste of good technology, it make me cry. It should work like any other USB drive. Try going through the usual troubleshooting steps. I can’t get mine to connect either… What is going on. I can’t get mine to work or my friends to work either. I’ve tried submitting support tickets, calling them at random times during the day and I get the automated line and it goes through a couple of cycles and then disconnects. I’m getting really frustrated with it!!! Ok… I have the same problem. I have called the customer service # daily for the past 3 weeks. I finally got ahold of some lady at the corporate office, but low and behold, she was unable to help me as well. This is soooooo frusterating. I’m ready to throw it away and go buy a NOOK! I received the Augen Ereader for Christmas and find it to be excellent. So simple to work with. Similar to an Ipod, but transfer of books rather than songs. The best feature is the back light. Can’t believe Kindle is so dim as not to offer a back light. Many people like to read in a dark quiet place, or during the night and not disturbing others. It has many great features font etc, and I would buy another one in an instant. If some consumers are unhappy is likey thery are not usung it for it’s prime purpose, being reading. I got mine from DX (dealextreme.com), about $98. The only problem I saw was big time to load large PDF magazines, sometimes need to reboot. Sincerely mine eReader it’s not an original “AUGEN the book”, it is a product of Chinese company HiVision . But it not differs from the original. Oh, sorry! It has difference in Menu icons and loading image at start up.